Install the correct installation file that matches the architecture (32bit or 64bit) of your Windows 7 install, taking all the default options and performing a “Complete” installation. At this point, you *must* reboot for this change to take effect before you start ANY tracing. Once the trace is complete, you will find a large .ETL file and a log file in C:\Boot_Trace. This .ETL file can then be compressed (using 7zip, winrar, winzip, etc.) and uploaded for analysis - however, due to its size, you will need to upload it to a third-party site such as MediaFire, MegaUpload or RapidShare. Once the trace is complete, you will find a large .ETL file and a log file in C:\Shutdown_Trace. This .ETL file can then be compressed (using 7zip, winrar, winzip, etc.) and uploaded for analysis - however, due to its size, you will need to upload it to a third-party site such as MediaFire, MegaUpload or RapidShare. Once the trace is complete, you will find a large .ETL file and a log file in C:\Reboot_Trace. This .ETL file can then be compressed (using 7zip, winrar, winzip, etc.) and uploaded for analysis - however, due to its size, you will need to upload it to a third-party site such as MediaFire, MegaUpload or RapidShare. Glad to see a tutorial on this. I've been reluctant to recommend xperf because of lack of tutorial and also because for the non-serious user I have feared that there would be more problems and situations created than solved. I do feel like the tool is good for the knowledgeable user. Nice tutorial, thanks for taking the time to write this. Fantastic! I didn't know you'd put it into a SF format, having seen just the one on your blog. You are the top expert I've found on this and we are very lucky to have you here. 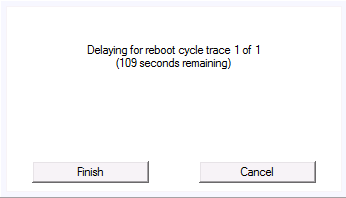 If I need to find out why my PC is taking 187 seconds instead of the former ~66, do I need all three traces? Which forum do you want them in? Installed the Windows Performance Toolkit per the tutorial and when booting up the first time I was presented with this BSOD right after the Windows boot animation finished. I got another at the second boot up about USB_BUGCHECK I believe was the error message. The third time no error message in the BSOD. Hi. I am doing a clean install with Gregrockers guidance and help. I was going through the event logs and found boot delay, standby degradation, delays caused by usb stick, sleep and hibernation errors. It all seems to point to bios yet Greg refered me to you first. I have a Mutt Mobo from Hp which does not support Win7 drivers for my system. So it does make me nervous to flash bios with a Universal driver for Amd that I found. I installed tool and ran all three traces. Boot trace delays 300 seconds (did it twice) 216Mb. Reboot trace ask for elevated permission before each 120 sec delay (did it three times... one time it quit trace due to an error) 241Mb. However I did not leave in USB stick when doing trace.....which was causing part of the delay errors. I will greatly appreciate any help. Yet, do help Britton first..... he is definitely priority. Just let me know if I need to redo traces w/stick plugged in. System Manufacturer/Model Number Hp presario v6620us 6500notebook series. Case The judge threw it out. Not enough evidence. You would want just a boot trace. As to the BSOD, sometimes the +DRIVERS portion of the command line can cause it. If you get frequent BSODs when attempting to trace, remove "+DRIVERS" from the command line for a trace and that should avoid a BSOD when taking a trace. You only need a boot trace, unless you want to get info on the others. I would recommend, if a USB key causes additional delays, that you take a boot trace with a USB key in. If you need help with traces, create a thread in the performance section and point me to it. BTW, I did mean to say reboot in relation to those times.